Like a fresh breath of Spring, our Eco Body collection is devoted to the art of renewal. Within this range, we have sprinkled posh Salt Scrubs and Sugar Scrubs that exfoliate the skin and sweep away dead cells, while ushering in cell turnover and a fresh palate for moisture. Our Sugar Scrub is born from organic Cane Sugar and finely crushed Turbinado, while our Salt Scrub is honed from Salts of the Dead Sea. Either makes a fine addition to your home spa repertoire! Here, exotic Banana Leaf is served in our earthy Salt Scrub blend of Dead Sea Salts, Shea Butter, Olive Oil, Vitamins A, Ester C & E. Although Banana Leaf is not at all the actual Banana -- but in fact the "leaf", we took due care to add some organic Banana's to this fine Banana Body Scrub. This exotic Banana Leaf Salt Scrub is served in a 16 oz. jar. A gratis 8 oz. Banana Spa Butter is included. Our Tamarind Scrub is one of our most beloved Sugar Scrubs. Here, organic Cane Sugar and finely milled Turbinado is blissfully blended with pure Tamarind and Lemon Essential Oil. We then add a gorgeous helping of Shea Butter, Ginger, Nutmeg and Lemongrass. The divine result is this drop-dead delectable Tamarind Scrub that is a melt-in-your mouth marriage of earthy goodness. Our Tamarind Scrub is presented in a 16 oz. recyclable jar. A gratis 8 oz. jar of Tamarind Spa Butter is included. Here, our vegan Ginger Milk Scrub wraps invigorating Dead Sea Salt in the skin-loving embrace of Ginger Root Essential Oil (Zingiber officinalis) fused with sweet Coconut Milk for a 100% vegan Ginger Milk Scrub. Together, each herbaceous Ginger and Coconut Milk for a sweet assemblage of aromatic decadence that will make Mother Nature stand up and cheer! This is heavenly bliss! Our Ginger Milk Scrub is served in a 16 oz. jar. A gratis 8 oz. Ginger Milk Spa Butter is included. Our Fig Scrub is showered in invigorating Dead Sea Salts,freshly pureed Figs and Fig Powder Extract (Ficus carica) that is hidden behind walls of pure Olive Leaf Extract (Olea europaea). This gourmet Fig Scrub is then sprinkled generously with an intoxicating mix of Jamaican Rum, Sweet Orange Essential Oil (Citrus sinensis), Cinnamon Essential Oil (Cinnamomum zeylanicum), a hint of Clove (Syzgium aromaticum) and a pinch of Ginger (Zingiber officinalis) for an edibly chic body treat that will have you eternally besotted! Our Fig Scrub is served in a 16 oz. jar. A gratis 8 oz. Fig Spa Butter is included. Our unrivaled Lychee Scrub blissfully blends fresh Chinese Lychee fruit with organic Cane Sugar, crushed Turbinado, Shea Butter, Olive Oil, Vitamins A, Ester C & E. The fabulous white flesh of the Lychee fruit runneth over with Vitamin C, Calcium, Magnesium and Phosphorus making it a highly nutritious body treatment that exfoliates and replenishes your temple. This is the essence of pure skin luxury! Our Lychee Scrub is presented in a 16 oz. recyclable jar. A gratis 8 oz. jar of Lychee Spa Butter is included. Our White Tea Scrub harnesses tender buds of finely crushed White Tea with a beguiling blend of Russian and Korean Ginseng. This is a seriously soothing Dead Sea Salt Scrub that flirts shamelessly with your skin, while Shea Butter, Hemp Seed Oil, Vitamins A, Ester C & E envelop your skin in oodles of moisture. Our White Tea Scrub is presented in a 16 oz. recyclable jar. A gratis 8 oz. jar of White Tea Spa Butter is included. 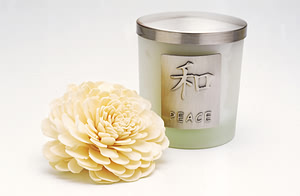 Our Shiso Scrub is an invigorating blend of Dead Sea Salt expertly wed with the Shiso Leaf Extract, Thyme and Ginger. Although the novel coupling of Thyme and Ginger may seem odd when paired with Shiso Leaf together these fine ingredients gives way to an addictively detoxifying Shiso Leaf Scrub that will pamper and delight you. And, we kindly admonish you not to wrinkle your nose at the thought of Shiso Leaf. This is a beautifully beguiling that aligns East and West in perfect harmony – as does this sweet essence of this seductively chic scrub. A Bestseller! Our Shiso Scrub is presented in a 16 oz. recyclable jar. A gratis 8 oz. jar of Shiso Spa Butter is included.